Channel hopping the other day got me to an Ajay Devgan movie. Now he is supposed to be one of the better actors in Bollywood. Watching him trying to act like a mentally challenged person almost caused me a seizure. What made it worse for me was the fact that he was trying to do a Sean Penn, a la 'I am Sam'; a movie I thought was almost near perfect when it came to portrayals. I always wonder how people can get through Bollywood fare without having a breakdown. 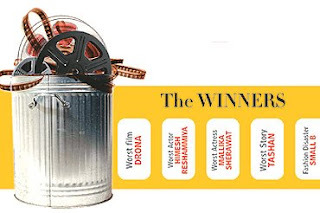 Outlook's annual Follywood awards picks the worst among the worse in Bollywood. Read about the 'winners' who made the cut, here. The best part is that even mainstream actors give in to the temptation to imitate and end up doing the roles badly. The question that pops up is can't they act or may be they concentrate too much on imitating at which they are really bad. Sir, Relating to brands counterfiet products face the same problem but stay highly popular only in the case of high end products. What should a brand do if the strategy is to imitate or follow a leader and the cost of switching is low?